‘Acid In The Style Of David Tudor’ is Florian Hecker’s first full length studio (as opposed to collections and commissions for art installations) album since 2003, when the groundbreaking ‘Sun Pandämonium’ was unleashed by Mego. Since then he has collaborated on audio projects with Yasunao Tone, Russell Haswell (as Haswell & Hecker) and a forthcoming live collaboration with Richard James as well a myriad of sound installation works, individually and with numerous artists worldwide. As the title suggests this album is referencing the parallel universes of modern 20th century composition and hedonistic rave culture. A challenging but ultimately rewarding set of Electronic Music compositions which push these two reference points into unknown areas. Set in apparent contrast are the sequence of six pieces Acid In The Style of David Tudor, where hyperchaotic functions are inherently coupled to their sources of manipulation - a Buchla modular synthesizer in combination with a Comdyna analog computer - in opposition to the ASA pieces, fruit of a complex manipulation of distinct auditory patterns into a new acoustic whole. The closing Ten opens with an intense head related localization blur. Here, virtual binaural, stereophonic, biphonic and monaural sound reproduction coexist. All three approaches are displayed into a contrasting dynamics, where non- linear waveforms and psychoacoustic illusions that constantly push our perceptual and representational fabrics. Following the ideas of Robin Mackay, Hecker’s work reinstanciates the genetic ofness, once proposed by philosopher David Kaplan, cutting both genetic and cultural territories of hearing. 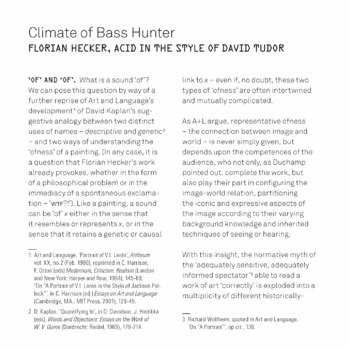 This release is available as CD and download with an extensive 12 page essay ‘Climate of Bass Hunter: Florian Hecker, Acid in the Style of David Tudor’ by Robin Mackay, founding editor of Collapse. It is recommended to listen to this material on loudspeakers at high volume. Headphone use is not advised.